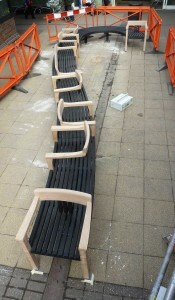 Well it’s in, our 10 metre long curving snaking bench outside of Waitrose and Fat Face in the Tudor Arcade, Dorchester. You never quite know how these things are going to go, specially when you are fixing into a surface where you don’t know what lies underneath. John, Mike and I were on site for around a day and half in the end and most of that time was spent setting out and finding the ideal position. It actually went in very easily in the end. It’s only as we laid it out on site for the first time that we had seen it together in its entirety, there was just not enough space in the workshop to do so. Mike deserves the credit as the maker on this, he has pretty much made it from start to finish, with the odd bit of help from John and I. He mastered steam bending and scorching which were not part of his ‘fine cabinet’ making skill set before this project. Lots of people commented as we were fitting as to how beautifully made it was, which is very rewarding to hear – that people still do recognise and value quality craftsmanship over something ‘off the shelf’ in mock Victorian black and gold. Saying that mock Tudor is no better, though thankfully there is little evidence of that in Tudor Arcade. The new skylights and entrance areas by Hutchison Kivotos Architects add a much more contemporary feel. 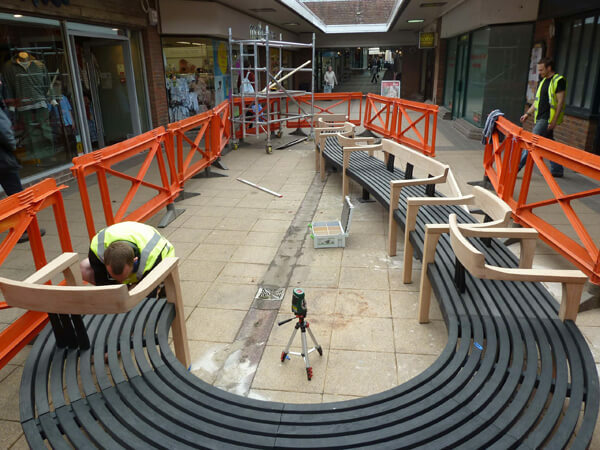 So, the bright orange barriers are down, the high vis vests come off, the tools are packed up and back in the van and we have other projects to think about. I’m looking forward to coming back and just to people watch, seeing old people plonk down on to it with a sense of relief, kids using it as a climbing frame and others using it as a meeting and greeting place. For months it’s been our bench in our workshop, now it’s everyone else’s to love, hate or be indifferent about, but perhaps most importantly, just to have fun and sit on. We are having our ‘creative launch’ on Wednesday 9th May at 2pm. Lots of creative types will hopefully turn up to wish it a happy future and get some fully populated sitting shots for the press. It’s also to help publicise the forthcoming Dorset Art Weeks festival, which we are of course participating in, it starts on May 26th and runs through until June 10th. Do come along if you can, there will be cake!